For the times when iTunes feels like overkill or Apple’s music-playing software just isn’t social enough, Everplay from Snarbsoft is a compact media player that also plays well with music social network Last.fm. A major Everplay update released on Monday brings a slew of new features, as well as a new lower price. New in Everplay 1.5 is complete control over the song queue and playlists that can now be displayed in a familiar list view, as in iTunes. A new full-screen mode offers complete player control, and a full screen “Party Lock” allows you to turn your Mac into a jukebox. Everplay can now fetch discography info from Discogs.com and lyrics from Chartlyrics.com, then add it all to the original iTunes track’s metadata. For Last.fm users, Everplay can now optionally disable a track in the iTunes library when “banning” it from Last.fm, or max the track’s iTunes rating when “loving” it. (A “ban” on Last.fm tells the service you don’t like the song and don’t want it used for music discovery purposes. A “love,” as you may deduce, does the opposite). 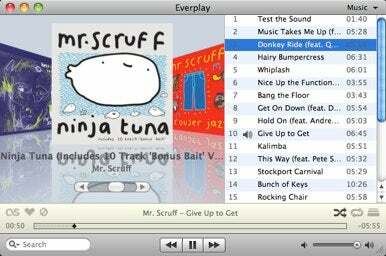 Everplay 1.5 requires Mac OS X 10.5 Leopard and iTunes 7.5 or higher. A free demo is available, and a license can now be had for $15, down from the previous $20.